Rob and I had a lovely week of vacation. We took the first week of November off last year and enjoyed it so much we decided to take it again this year and will probably continue to do so. Our first full day off was Halloween and that is always a fun time around here, as we get into the spirit of things by dressing up and putting some decorations outside for the kids to enjoy. 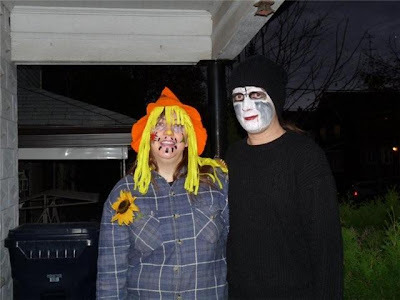 We had some friends over to take their son trick or treating, and spent some time outside chatting with the neighbors and enjoying way too many jello shooters. Sunday morning we were off to beautiful Niagara on the Lake for the day and night. We did a bit of shopping, had a delicious dinner out and then went to Fort George for the last ghost tour of the season. We spent the night at "Davy House", a beautiful and charming bed and breakfast that will see us as repeat customers. We stopped into a few shops in the morning and then headed home as we had plans that evening. Monday night we went to our "bird store" owned by a couple we now call friends to help them decorate the store for the upcoming holiday season. Tuesday and Wednesday were spent at home mostly, except for running some important errands, like getting a new Christmas tree. Thursday night we went to the "Jersey Boys" with a group of friends. We met for dinner before the show at Moxie's. Food was good, service was slow as our waiter was training someone. I wouldn't recommend doing that when you have a group that needs to be out at a certain time to catch the curtain call, but we all made it just in time. It was my third time seeing the show and Rob's second. I love the production and will see it at least one more time before the end of it's run. Friday morning we had brunch at Cora's on our way to St. Jacob's for their "Sparkle Festival". The main street is beautifully decorated for the holiday season, the stores stay open later, many with specials and offering holiday treats like shortbread cookies and apple cider. We did lots of shopping and had dinner at Benjamin's before heading home. Yesterday and today are spent at home getting ready for the return to the working world. I'm already looking forward to my two week break at Christmas. Sounds like a fabulous week off! Angie ... it sounds like you and Rob had a wonderful week!